Proud to be on the Frontline on the war on terror! By placing an order from MFI LLC, I understand, acknowledge and agree to the Export Policy. I am a U.S. Person and I do not intend to export (directly or indirectly) this product. I forgot that we even made these. Now that we are sold out of the HD Sniper Scope Rings I am blowing these out. We stopped production when the Chinese started knocking off our rings to the exact specification. We could not compete on price when we make ours in the USA. 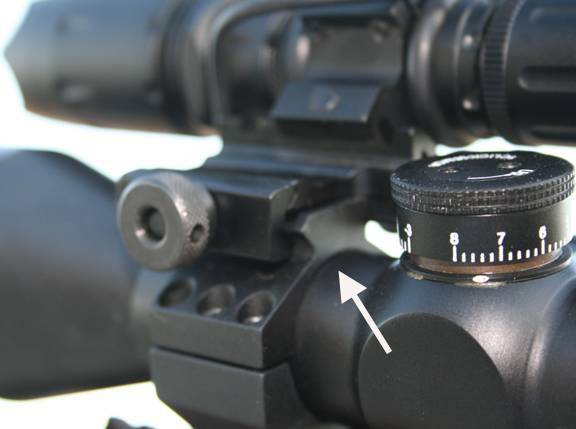 So there are many scope rings out there that these will fit on to. I have listed the important information so you can measure what you have to assure a good fit. The second photo gives you these same measurements in a drawing format. These replacement scope ring tops allow the use of many different accessories from lights, lasers and levels, so the applications are endless. The 3rd photo above shows this same item on one of our HD Sniper Rings (no longer made) with a 45 degree attachment with a flashlight mounted to it. These are Weaver / Picatinny style meaning that they will accommodate both types of accessories, but the slot lay out (distance between slots) is not 1913 Mil. Spec. Picatinny. We offer these as Individual. This page is for ONE (1) Individual Top Ring Rail. 30mm Diameter but, will accept 1" inserts for 1" diameter optics (not included). Overall Length / Thickness: @ 1.008 inch / 25.65 mm. 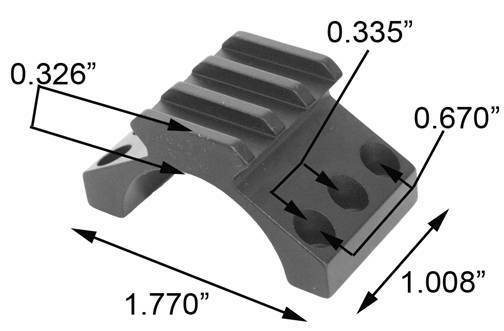 Center to center bolt distance @ 0.335" with #1 center to #3 center @ 0.670"
Overall Width: @ 1.770 inch / 42.2 mm. 6061 T-6 Aircraft Grade Aluminum. Military Matt Black Finish (Anodized). Light Weight @ 0.6 oz. This item is NOT RESTRICTED FOR DOMESTIC US SALES in any way and we offer DOMESTIC USA shipping to ANYONE. We ship to all 50 US States as well as all US Territories i.e. Guam & Puerto Rico. Sorry we can NOT ship to ANY APO address regardless of actual location. This item is 100% RESTRICTED FOR EXPORT OUTSIDE THE USA. The US Department of State regulates / restricts this product and it is NOT EXPORTABLE outside the USA even to LE, Governments or Military without State Department approval. This approval is AVAILABLE through MFI as we are an ITAR / Dept. of State Registrant with the Directorate of Defense and Trade Controls Office. We can obtain a US State Dept. Export License for you. Please feel free to contact us if you have any questions on this issue. All images are the sole property of MFI LLC and are protected by copyright laws. Most of our products are protected by Utility and or Design Patents. MFI is a Registered Trademark. We do NOT tolerate any violations of our Intellectual Property Rights. SPECIAL NOTE ON STYLE & TRADE NAMES: "HK", "MP5", "G3", HK94, as well as other marks, are Registered Trademarks of Heckler & Koch and are used on this web site for reference only. This item is NOT manufactured by HK (Heckler & Koch). This real weapon's manufacture has NO relationship to this product, nor any product offered by MFI. FN, FNH, Fabrique Nationale, PS-90, PS90, P90, FS-2000, F2000 as well as other marks, are Registered Trademarks of FNH and are used on this web site for reference only. This item is NOT manufactured by FNH. This real weapon's manufacture has NO relationship to this product, nor any product offered by MFI. Knight's Armament has Registered Trademarks & if any are used on this web site they are used for reference only. This item is NOT manufactured by Knight's Armament. This real weapon's manufacture has NO relationship to this product, nor any product offered by MFI. Israeli Military Industries has Registered Trademarks (UZI + others) & if any are used on this web site they are used for reference only. This item is NOT manufactured by IMI. This real weapon's manufacture has NO relationship to this product, nor any product offered by MFI. Thus any mention of or use of trade names is done in reference to the real weapon for which these items are designed to fit on to. No MFI offered product has any Trademarks or other IPR use on it other than our own. We do this to be sure that there is NO CONFUSION IN THE MARKET. FREE SHIPPING on all orders over $100.00 See our detailed shipping rates. 60 Day Money Back on Returns. View our policies and procedures. Weekends & Holidays I am in the R&D Shop, so if I hear the phone ring I WILL answer it.